Invisalign® - Dr. Bong Kwoo Inc.
To help you get a more beautiful smile, Invisalign uses a series of clear, removable aligners to gradually move your teeth. You wear a set of aligners for one to two weeks, removing them only to eat, drink, brush and floss. 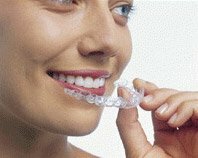 As you replace each set of aligners with the next in the series, your teeth will gradually move until they reach the position the doctor has prescribed for you. The average treatment time is about a year.